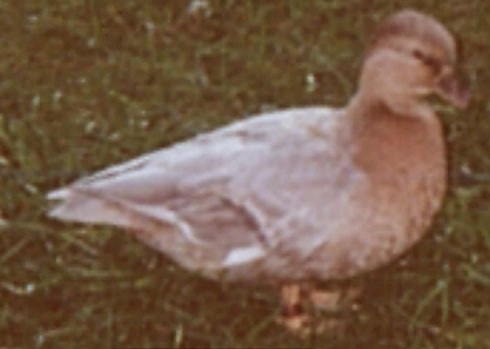 From the early 1960s until 1967, I raised large breeds of ducks exclusively. As time went on, however, I realized two things, first that I was having a great deal of difficulty raising the number of Aylesburys and Rouens I needed to raise to be competitive on my small piece of ground. Secondly, I sensed that many others had the same problem and were looking for a breed of duck that possessed the same attributes as the bantam chicken: bantam chickens required less space to raise and also less feed. That realization led me to look more closely at the Call and Black East Indie, the two most commonly shown bantam ducks at the time as they are today. The Call had actually been around for a long time, having evolved from birds bred from the Mallard to use as live decoys as early as the 1800s. Those who developed the early Calls as decoys had no interest in creating birds with modern Call type- they wanted minature Mallards with long bills and flat heads. As a result, the Call had a long way to go to what it is today. In the early 1970s, the Call classes were usually moderate in size and classes of 100 or more were pretty rare. The classes were made up almost entirely of Grays (the original color) and Whites. Other colors were in development but were not really numerous or common in shows. The average Call was somewhat larger than it is today but size was not the main problem. Good Call type was still hard to find. Short bills and deep, short bodies and round heads were in short supply. A really small bird regardless of type, often placed above a bird possessed of good Call type but larger in size. A sinus condition that was quite common especially in the smallest birds complicated the judge’s job. In short, birds that had “the whole package” were very rare even in the largest shows. For pictures of some of the biggest winning birds as well as full details about the people who bred them, I refer you to Darrel Sheraw’s definitive book on the Call: The Call Duck Breed Book. During the late 1970s, the Call classes began to show real growth as more and more exhibitors came to see the virtues of raising the small ducks. Call judging too was undergoing growth as more judges made the effort to become truly familiar not only with Call type requirements but also with the best tactics to use in comparing birds in the increasingly large and competitive classes. I recall one particular judge who would locate what he thought was a superior bird. He would then carry that bird along with him and place it in the cages of other birds he thought were good. By the time the original bird had been treated as an intruder by a half dozen others, it was so scared that it would show poorly and would generally lose. Such were the growing pains as the Calls were slowly recognized as one of the more important classes in many shows both in terms of numbers and quality. By the early 1990s, three things had changed for the better for the Calls: the classes were quite large (sometimes huge), the quality was much deeper (many exhibitors owned good ones), and the judging was more experienced and much more consistent. This 2001 hatch Acorn Hollow Pastel Call female was Reserve Champion Call at the Minn. State Show in a class of over 200 Calls in October of 2001 She was one of the first Calls other than White or Gray to do so. One thing contributing to the large increase in the size of the Call classes was the proliferation of new color patterns being introduced. Darrel Sheraw started the interest in new colors with his Blues in the 1970s and then Graham Oakford introduced the Snowys and Pastels. There are now Pastels good enough to be named Best Call and more new color patterns are being introduced almost every year. The Butterscotch variety is also destined to take it's place among the most popular of the newer colors. There are even crested Calls being bred and exhibited today. Furthermore, Calls hold their own in most parts of the country when overall championships are handed out. In short, someone who had not seen Call classes since, say, the late 1960s would hardly be able to believe the progress that has been made. At the 2011 Crossroads of America Show held in Indianapolis, Indiana, the bantam duck class consisted of 749 birds. All but less than 100 of those birds were Calls.